I have one more “zig zag” design to share with you this week. If you slightly rotate the “zig zag” design you’ll end up with some stairs. In the example I followed the edges of the blocks to form the stairs. I only echoed the design once in the middle of the other blocks. I think it would look fabulous with 2-3 echoes in between the main blocks. 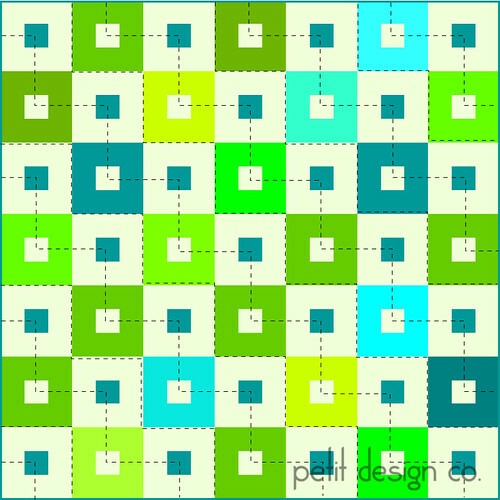 This design does require a lot of pivoting so I might rethink that idea if this were a queen size quilt. Never thought of doing this. I like it. You need to write a book about these ideas. They are wonderful! I agree with Linda about the book... so many good ideas! This one looks simple enough for a beginner like myself. I have always just done regular straight lines,or stitch in the ditch quilting.